May has been a jam-packed month. Between birthdays, anniversaries, and writing a new manuscript, I’ve been neglecting this poor blog. So, I’ve decided to have a little more structure to my posts because, let’s face it, everyone needs a little structure now-and-again. My original goal was to do a post every other day but that’s just not realistic for right now. Plus, I’ve kind of run out of things to write about. After some thought, I decided to create a weekly post. And because I got really into it, I made a button. So what does this mean? It means that along with occasional posts about baking, cooking, books, fur babies, and photos, I’ll share a musing – a thought, if you will. Taking a bit of pressure off is always a good thing, right? 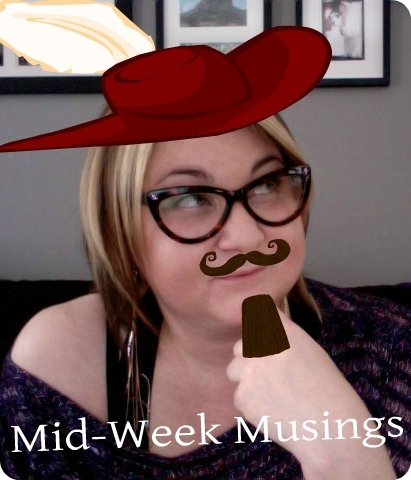 And I can commit to a weekly musing post, right? RIGHT?! Haha! All right, so let’s get to the actual musing! When The Remix and I started dating, we were board-game-aholics. Monopoly, backgammon, Sorry – we played them all. First, it was at the kitchen table. Then we moved to the couch. Finally, we took it to the bedroom, playing on top of the covers while propped up against the headboard. It was awesome and we loved it. When we moved to New Brunswick, our board-game obsession kind of went away. I'm not really sure why, but it happened. Here's a sampling of our board games, stacked up in our front hall closet. Not exactly the kind of storage that implies frequent use. A few weeks ago, though, we were bored. So, The Remix went to the closet and managed not to get pummeled by falling games picked out an old favourite: Yahtzee. For those who are unfamiliar with Yahtzee, I’ll give you a brief lowdown. Each player (up to four) rolls five dice and gets three rolls per turn. The goal is to fill out the score chart, which you can see below. Well, dear readers, let me break it down for you. 6. The dice make an awesome sound when you shake them in your hand and then toss them on a table. And it’s double awesome when playing on a glass table. Oh yeah, that’s a good sound. 5. It’s a fast game - not much more than eleven minutes, per round. That means that you can play at least two rounds, and then the inevitable tie-breaking round before you're over it. 4. It’s super portable! All you need is the dice and the score sheet. You can Yahtzee on a plane, a boat, the beach (errr…not on the sand, though) – just about anywhere! 3. It makes you good better at math! I can’t tell you how much better I’ve gotten at doing addition in my head since our Yahtzee revival. There are lots of numbers, often DOUBLE DIGIT numbers that require precise calculation in order to determine the victor. That means that not only is the game fun but it’s also EDUCATIONAL! Sure, you could use a calculator but then it would be substantially LESS educational. Confession: okay, sometimes I use a calculator but only when my brain is broken. 2. The level of nervous anticipation you feel when you NEED the elusive Large Straight and have a 1, 2, 4, 5, 6 with only one roll left (oh, the ever elusive 3...damn you!). Or when you roll Four of A Kind in your first roll and then have two more rolls to sore a Yahtzee. This level of nervousness is obviously MUCH higher when the person you’re playing against has already gotten them. If only my novels had that much tension (I kid, I kid…they do! Haha). 1. The level of PURE EXCITEMENT that comes after successfully rolling what you need! No matter how many times I’ve played, I can’t help but throw my hands up and yell Yahtzee (or whatever else I was going for). Also, it's a great opportunity for a double-high-five. 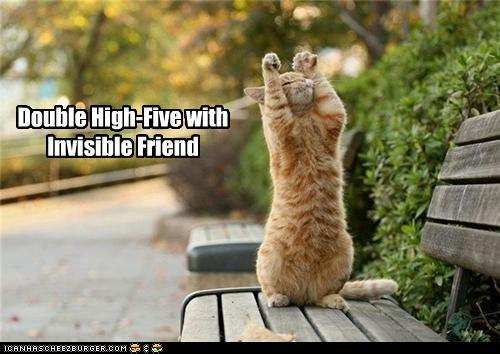 And who doesn't love a double-high-five? Errr...I guess that technically you could play alone but it's far better with at least one other person. But this picture made me giggle, so it stays. So tell me, what are your favourite board games? Love the picture too! He (or she) is so tute! I haven't played a board game in a very long time. We used to love to play Taboo. hehehe. so distracted by that last picture!! I used to love Yahtzee!! That game is awesome (along with scattegories and life). I used to love to play board games! I love games!! My hubs...not so much. Cant even get him to play Words With Friends with me. I love a good game of trivial pursuit because I am a nerd like that!